Euro is growing against US dollar. At the moment the pair has almost reached the resistance level of 1.2100, after the breakout the next target will be at the level of 1.2144. US currency is falling due to the geopolitical risks: strife and meetings against the authorities in Iran continue , and Washington states America is ready to help the protesters in case of brutal repression. According to foreign policy experts, the protesters’ chances are minimal. The UN is planning to hold a meeting to find a solution to this crisis. On the other hand, the further growth of EUR is restricted by a few of factors. Firstly, US economy is growing: the Initial Jobless Claims index has been staying below the level of 300K for more than half a year, which reflects the economic growth. Secondly, the monetary policies of the counties differ significantly: ECB is only planning to cut monetary stimulus, as US regulator intends to increase the interest rate twice or thrice in the current year, which will strengthen USD. Today the traders are focused on EU inflation data releases at 12:00 (GMT+2) and US employment markets statistics publications at 15:30 (GMT+2). The experts suggest European CPI fall to 1.4% in December from 1.5% in the previous month, as US Nonfarm Payrolls will decrease to 190K in December from 228K in the previous month. US Average Hourly Earnings are worth investors’ attention, too: the indicator is expected to grow to 0.3% in December from 0.2% in the previous month. 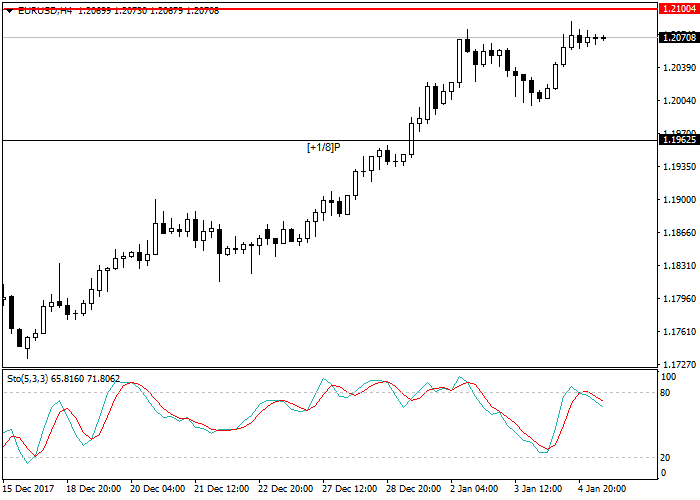 Stochastic is at the level of 65 points and does not give a signal to open the positions. Short positions can be opened at the resistance level of 1.2090 with the target at 1.2055 and stop loss at 1.2115.